Dev team has some former BioWare people on it. Bonus! Flying Helmet is off to a big start. The small studio is comprised of a handful of designers and developers, a few of which are former BioWare employees. Their first offering is Eon Altar, an RPG built around local multiplayer interaction handled via smartphone apps. This opens up a whole big box of co-op intrigue, including the ability to get secret information and keep it from your couch-bound allies! 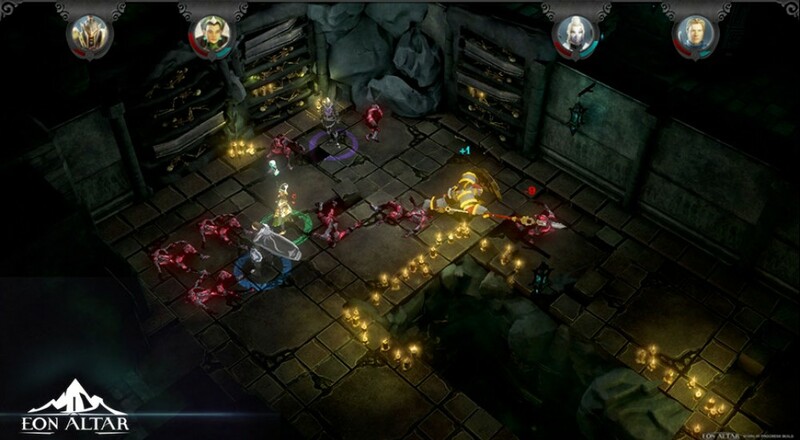 Gameplay in Eon Altar is built around combat, NPC interactions, and exploration. Fighting foes is a turn-based tactical affair that puts all five characters' abilities to the test, not to mention your own ability to work with your team. Since each human player has their own smartphone screen/controller, information can be passed to individuals without the group knowing about it. What's that about a secret treasure hidden behind the barrel? Why sure, I'll share that with the group. After I get all the good stuff for myself. Eon Altar had a failed Kickstarter campaign towards the end of 2013, but development still chugged along. We even had a hands-on with it at PAX. The project is now on Steam Greenlight looking for support. The mobile version is coming soon, as are the PC and Mac versions with their companion iOS and Android apps.